Rock Landscaping recently completed this retaining wall project for a customer in Horseshoe Lake. Many times, a property on a water’s edge is fighting the elements as waves relentlessly wash the shoreline away, or occasionally overflow the lower portion of the property and begin to wear away at the slopes. In this case, the property owner wanted to strengthen the shoreline to keep the lovely backyard and landscaping from washing away, so we designed and built a two-level natural rock retaining wall. 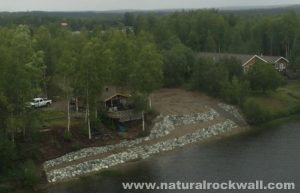 Like most lakefront property owners in Alaska, this customer also wanted snowmachine access to the lake during the winter, so we installed natural rock steps leading from the top of the property to the water’s edge. We are firm believers in natural stone for our retaining walls. In this particular case, natural stone allows the water to continually wash against the wall without affecting its original color. And as natural rocks settle, they tend to fit together better and better – unlike keystone or other retaining walls that need to be cemented together. Cement and other man-made materials will eventually weaken and crack, and affect the structure. Natural stone will only weather and continue to hold in place! Want more information on our natural retaining wall design and installation? Give us a call or contact us today.